On the top of the World...: Wittians Renewed Their Pledge To Make The Earth Greener!! Wittians Renewed Their Pledge To Make The Earth Greener!! Cub/Bulbul develops the overall personality of a child taking care of both the physical and mental makeup which has become paramount in today’s world. Wittians of Grade I – V participated in Cub/ Bulbul activity on July 22, 2016. The activity started with the pledge and exercises. The scholars were given information about the Founder member of Bharat Scouts and Guides Lord Baden Powell. 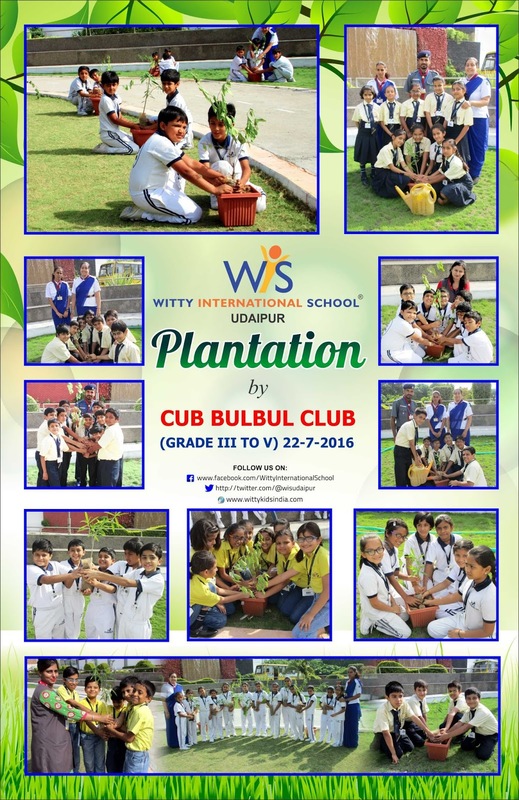 The activity ensued with the plantation programme under the guidance of Flock Captain Mrs. Lata Paliwal, Scout Captain Mr. Vikas Singh and Guide Captian Miss Deepika Devra, where they were also given information about the importance of trees and the usefulness of plantation ! !